Tucker, a German Shepherd mix, has a great home, up until he finds himself homeless. This is his journey from homeless to a business logo. This story is fiction based on truth. “Tucker’s Story” by Bobbie Asad is sweet and heartbreaking – even more so because you know this is a scene that is played out countless times a year across the Country. Tucker was is a German Shepherd mixed breed dog, one who was loved and sheltered in a close family for 3 years. Unfortunately, that relationship came to an end and Tucker was left, alone, in a park. How many time have I read a news article on line regarding abandoned pets? Too many, way too many. Tucker was lucky, he was found by a rescue – but other dogs and cats are not so lucky. This story ends well, with a smile and a tear in the eye, but it also teaches and relays a very important message. 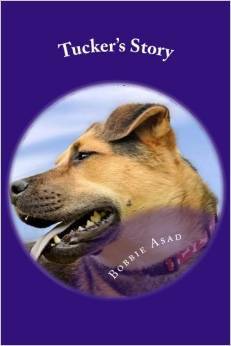 Written from Tucker’s viewpoint and aimed at children 7 and up, it’s a quick tale that will have a lasting impact. We need to care for the responsibilities we accept, and if life prevents that from happening then please, for the love of everything, take them to a Rescue – don’t leave them alone and don’t take them to the pound. This story deserves more than 5 stars and I would give them if I could. If you were laid off after 30 years in engineering would it make you mad as a hatter? Bobbie Asad embraced her change and became the owner of Mad Hatter. She took her fascination with hats as a member of the international social group the Red Hat Society, along with her love of teas, and the specialty shop Mad Hatter was born. Bobbie opened Mad Hatter in its present location about a year ago in downtown Fuquay-Varina, North Carolina, where the unique shop has been earning rave reviews. Bobbie’s skills as an entrepreneur are apparent in the range of services and delights available in one shop from teas and tastings to hats for every occasion, along with locally produced and sourced lotions, sprays and soaps. Bobbie is a smart retailer who knows hats and her customers – women who want to stand out- no two hats are the same. She has the evolving marketplace that prizes originality and locally produced products well in hand-she even features specialty food items that are also locally produced. Bobbie Asad took the lemons life handed her and made tea!